On my writing/speaking journey, I've had the pleasure of meeting and being under the teaching of some wonderful mentors. 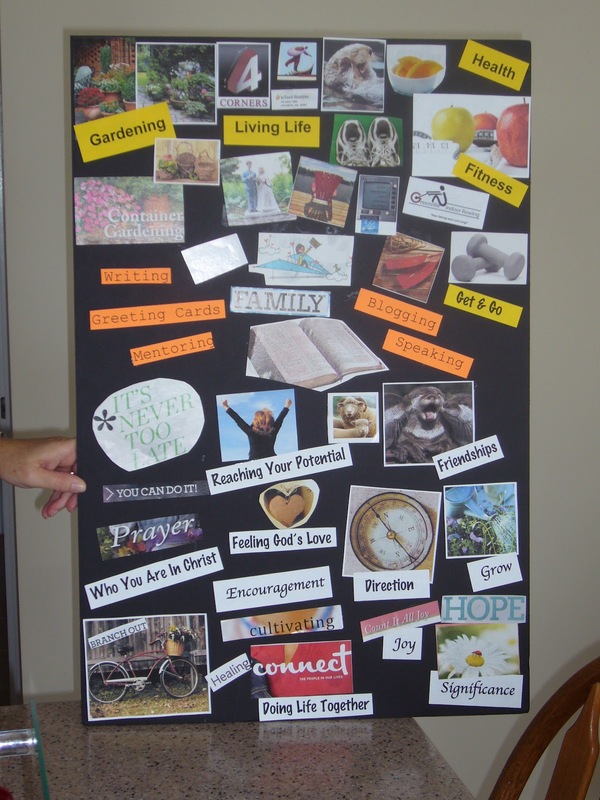 One such mentor, Carolyn, recently opened my eyes to the Purpose Board. What began as a solid black board eventually became a visual tool to keep me on track to what I feel is my purpose at this moment. I began by thinking of the things that are important to me or that I enjoy . . .
My desire is to use writing (articles, stories, books, greeting cards), speaking, blogging, teaching, and mentoring to encourage others. The words I placed on my Purpose Board keep me focused as I weave in and out of each day -- words I want to remember as I try to always be an encouragement to others. What's your purpose as you weave through each day? Would you like something visual to help you stay focused? Try making your own Purpose Board. Take those magazines you have around the house, purchase a board or poster, and start cutting out pictures and words that have meaning to you. Before you know it, you will have your own board. And . . . what began as a visual tool to keep you on track will actually end up being . . . a snapshot of the desires of your heart. I think I'll revisit my purpose board!